I can wrap a perfectly decent gift. I almost always eschew the bag and tissue combo in favor of actual wrapping paper, and I try to keep a couple of cute gender neutral roles on hand so I don’t end up showing up to a five-year old boy’s birthday party with a gift ensconced in hot pink festivity. Where I fall short is in the extra credit category… That little touch that takes a gift from good to great. My friends Julie, Ann and Achlee are brilliant at this. Julie has a trove of pretty paper on hand, you know, the kind that you make every effort not to rip while unwrapping your gift. Ann always includes a little gift on top of the gift. A few years ago she topped cute IKEA dollhouse furniture with…little dolls. Perfect. And Achlee uses gorgeous vintage and found fabric, trim, and paper…My favorite was her period of wrapping baby gifts in vintage children’s sewing patterns found at a thrift store. Seriously cool. 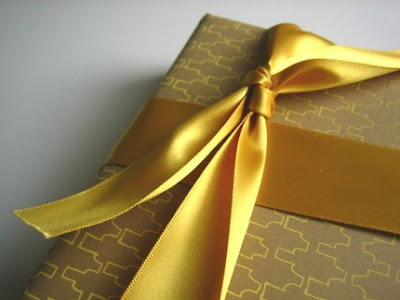 The best part of these wrapping tactics is that they're not about spending a lot money or a lot of time, rather it’s about putting a little bit of thought into it, making the recipient feel extra special. i love the paper on that last photo... must visit that blog right now. gorgeous. I read in Real Simple once that keeping plain white wrapping paper is great b/c you can always cater it to the event with ribbons, bows & accessories. Totally agree with you Jos...Julie has the golden touch when wrapping a gift! i'm thinking of developing a signature wrapping style - so the recipient always knows who it's from eg brown paper and blue ribbon. wait! i think i read that in real simple too - a tip on how to be perfectly organised. I'm the queen of the gift bag...I am a terrible gift-wrapper!! My hub does it all! Before that, my signature style was wrap jobs that looked like they had been executed by a 5 year old. Using cloth bags is the green solution, and it can be really cute with some good fabric. Otherwise, I agree with the plain paper/fun bows and ribbon approach, although I do really like the paper you show here. Small ornaments are easy gifts to add to the top during the holidays - I like using non-breakables like little wooden soldiers. I am too cheap, er... thrifty to have really beautiful papers and ribbons around. I really like to wrap presents in brown paper, though. I used to have a roll of it somewhere. Then I wrap up the paper in cord. Sometimes I have used red cord, sometimes plain old twine. Then comes the personalizing. Twigs of pine needles are great for christmas. Round dot stickers from the stationery store are cool... and you can go without the cord. I seem to recall painting and drawing on presents, too. Oh, and tissue paper... I used to layer coordinating tissue, wrap it up and then do cut outs in the same colors and glue them onto the front. Paper flowers! Then there's newspaper... especially comic pages. A colorful funny pages and some bright curly ribbon? Fun. Oh, and a thrifted scarf is excellent for wrapping presents, particularly for a stylish woman. It's a wrapping and an extra present! You could decorate the knot of that with an old brooch or pair of costume earrings. Lovely, lovely....such sweet ideas! I love that you are going to frame yours....that is an awesome idea too! brilliant ideas you guys! love it! I love the vintage sewing pattern idea! Sadly, my wrapped gifts tend to be lacking in creativity. I usually just wrap in brown kraft paper and then tie it up with colored embroidery thread or real ribbon. For Christmas, I usually like to stock up on cute little ornaments to attach to the top. I'm all about using simple tissue paper in a bright, solid color, and then getting some beautiful satin or grosgrain ribbon and creating and creating a sculptural origami effect here. The ribbon is fun to play around with and you can create some really intriguing no-sew shapes with a little glue and strategically placed double-sided tape! wrapping gifts is pretty much my favorite thing to do. for christmas this year, i have decided to wrap with brown craft paper and then hand paint a christmas scene on the outside (if you artistically challenged, there are plenty of free online templates to use). i ALWAYS use martha stewart's sheer ribbon garland (at kmart) for bows (on presents, trees, and doors). i also like to include a small gift on the outside (usually bells for xmas). seriously, martha stewart everyday at kmart has an infinite selection of goodies to use on gifts. i would try there for other ideas too! Love your blog! I hope you dont mind, but I linked to one of your stories on my own blog:) Spreading the great ideas and inspiration! i love the ikea doll furniture idea + doll on top. so cute! i like to let my kids color on brown kraft paper at christmas time and wrap with that. or you can cut a potato in half and let them stamp with an inkpad or tempera paint on a plate. even without carving anything into the potato, the roundish shapes look really pretty. christmas time is coming! yipee. but it's still 85 here. also there is a white bowl on that post I have been meaning to show off to you, oh lover of white! kristin jo seriously stunning wrapping (and bowl!) is that your font on the card?? gorgeous! For the holidays I've actually stopped wrapping most of my gifts in paper - I instead buy simple brown boxes in assorted sizes(from Michaels and the sort) and just use really pretty ribbon and gift tags (last year I cut out felt tags and hand stamped a scripted initial on each one)as well as added boxwood branches, holly, cinnamon sticks etc...as an added touch. They surprisingly look really pretty plus it saves me tons of time and I feel a little better about not having used so much paper. 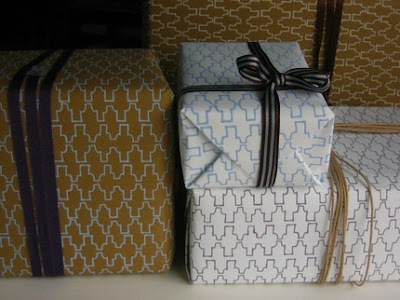 I like to use brown paper and decorate with ribbon, paint or stamps depending on the occasion. 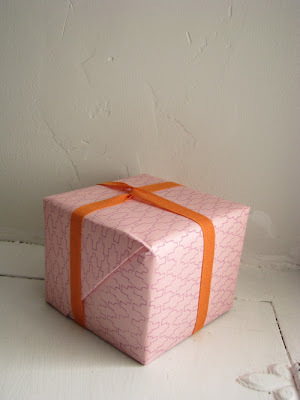 You can also decoupage the box itself with things pertaining to the gift recipient (i.e. magazine pics, family pictures, seed packets etc. ), then they have a sort of memory box in addition to the gift. This year I'm planning to do some gifts in tin cans... I saved and cleaned leftover coffee, soup and tomato cans. I plan on leaving some plain and attaching ribbon or beads and filling with gifts and tissue, some I might paint or decoupage also. These can later be used as holders for pencils, art supplies, kitchen utensils etc., plus you are re-purposing items so it's a fairly green solution. I bought some brown paper at Michaels (actually the stuff Fed Ex sells to wrap packages is the best and the cheapest!) and plan to use cake twine (the red and white kind) or ribbon. The ribbon will be wrapped around in an off-center band. Kinda minimalistic, but looks sharp too. You could do the same with white paper. And it's good for any event. I hear you! I adore well wrapped parcels....such a dream. I loved the ideas your friends had for wrapping gifts, so lovely. I love to use linen tape for the ribbon...but that I suppose is not very clever or original. Have giftwrapping down to an art -- it's one of my favourite things. One Christmas, used heavy brown craft paper, wide lengths of luxe white velvet ribbon, and carefully glued a lovely arrangement of pinecones and sprigs of evergreens to the each gift. The result was an elegant and ultra stylish winter-wonderland theme. My son once wrapped a gift for a friend (teenage girl) with Magazine photo and used ribbon to tie on what he called a bow ---an old TV remote. It was a great conversation piece at the party. I think he has watched me too long try to use unusual things to wrap gifts with, like the baby shower gift - a baby sleeper put in a balloon blown up or a bridal gift put in a package so that when it was open confetti blew out. I love all the ideas here! Especially being able to recycle old bits.